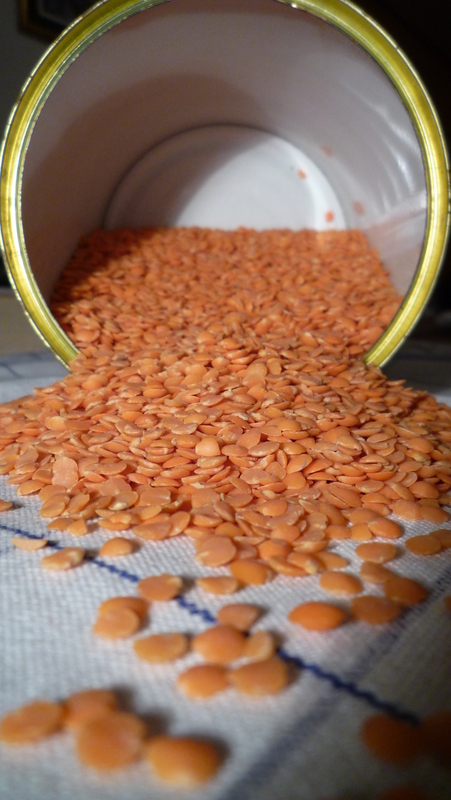 Lentils are among the healthiest foods, partly because they contain plenty of protein and other goods. They are among the earliest food cultivated in the Near East (those facts are candy to me as a history student) They are eaten in many parts of the world in many different ways and go by the name daal, dal, lens, linzen and probably plenty of others too. Anyway, I like them but my boyfriend doesn’t. So even though he doesn’t complain when I make them, there are no compliments either, only when I hide them in a soup does he happily spoon them away. 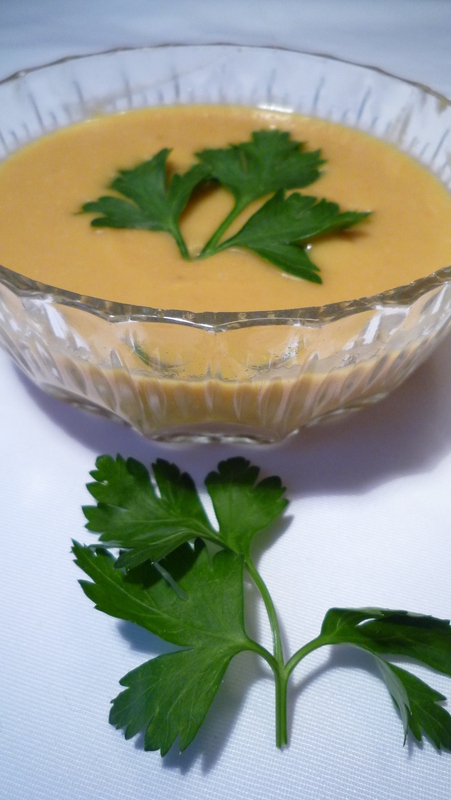 This red lentil soup is very filling, so great when your stomach is calling you. Cut the onions, garlic, carrot and capsicum small. If you like a spicy soup, you can also cut up the pepper, otherwise just cook it in a whole. Warm some oil in a soup pan and sauté the onions, add the garlic and the pepper, sauté for another minute and add the carrot and capsicum. Sauté everything together for another 3 minutes without browning it and add the lentils. 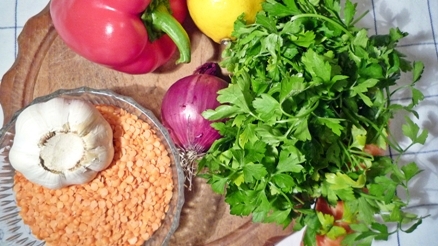 Mix the lentils with the vegetables and poor in 3 cups of stock. The lentils will soak up some liquid so check after a while if there is still enough stock, if not add some more. The vegetables should be covered in stock. When the lentils have lost their shape and the carrots are soft, the soup is ready. Add juice of half a lemon and taste if it needs some more. Season with cumin, pepper and salt to taste and garnish with some chopped parsley. You can play with the seasoning; maybe add some curcuma, masala kerrie or paprika. I made almost the same soup today but instead of serving it like it is, I pureed the soup and added some left over shredded chicken. I replaced the cumin powder with coriander powder. I used home made chicken stock and cut back on the lemon. A very different soup with only minor adjustments. There are many good things I can say about garlic but the main thing is; it is delicious and healthy at the same time. Garlic and onion are used as a basis for many dishes but can also be great stand alone. I made this the other night for some friends, we had a nice ciabatta to spread the garlic on, I should have made more, it is so easy and disappears so fast. You can keep it in the fridge and add it to other dishes as well. You can also mince it into a paste and serve it like that but I like to scoop out the toes and spread it on the bread myself. Of course this is not something I invented; it is a very well and wide spread phenomenon but just for the few who are still unaware of this heavenly treat. Cut of the end of the garlic so you display the top of the toes. Take away some of the paper skin. Put a layer of olive oil in a little baking dish, sprinkle some herbs, pepper and salt and put the garlic head with the cut side down in the oil. Cover the dish with aluminum foil and put in the oven for about 40-60 minutes on 200c. When you take it out of the oven, let it cool down before serving. If you don’t have a little baking dish, just make a little package of aluminum foil and pack the garlic head in there with the oil and herbs.